Israel's Dead Sea - the lowest point on earth and one of the natural wonders of the world – is fabulously rich in minerals. Visitors flock to the Dead Sea from all over the world to scoop up the nourishing black mud and give themselves an impromptu beach spa treatment. Water and mud from the Dead Sea has been shown to be effective against chronic skin complaints like psoriasis and eczema, but also makes wonderful everyday skin care products. Mud, which contains tiny particles of clay, is nature's most efficient cleanser. 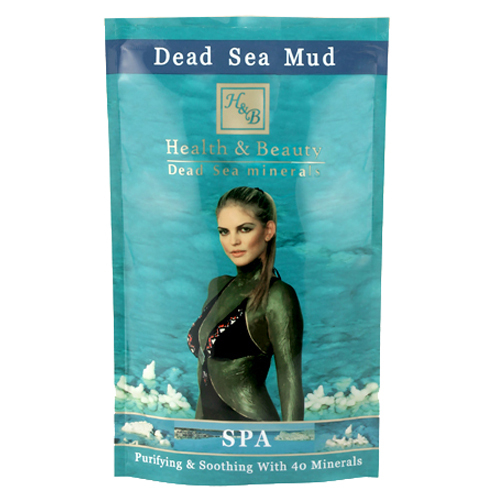 Dead Sea mud contains a wide variety of minerals, including magnesium, calcium, potassium, chlorides, zinc, lithium, chromium, iron, iodine, and barium. Tourists at the Dead Sea can be seen sporting a second skin of black mud, but if you can't make it all the way to the Dead Sea, bring some of the benefits of the Dead Sea to your skin. Dead Sea Mud soothes while invigorating and rejuvenating the skin's appearance, and can be used on all skin types. Use: Spread Dead Sea mud on skin. Let dry, then rinse off thoroughly with warm water. Silt (Dead Sea Mineral Mud), Aqua (Water), Benzyl Alcohol, Salicylic Acid, Glycerin, Sorbic Acid, Bentonite (Mineral Clay), Iron Oxides.